Gig Harbor home prices—is it a seller’s market? Yes…and No! While reports of current home sales indicate it is a seller’s market, that is not completely accurate for Gig Harbor and Fox Island. While it is true for much of the Puget Sound, it is a bit different where 72% of homes listed is above April’s median selling price of $500,000. This is a “dual market” for Gig Harbor home prices. Extremely low inventory under $500,000 has created a seller’s market with only 1.2 months’ supply. Multiple offers are common in this market and successful buyers will be well prepared with financing pre-approval lined up. Months’ supply is calculated by dividing current inventory by the number of contracts accepted (pending) for the previous month. 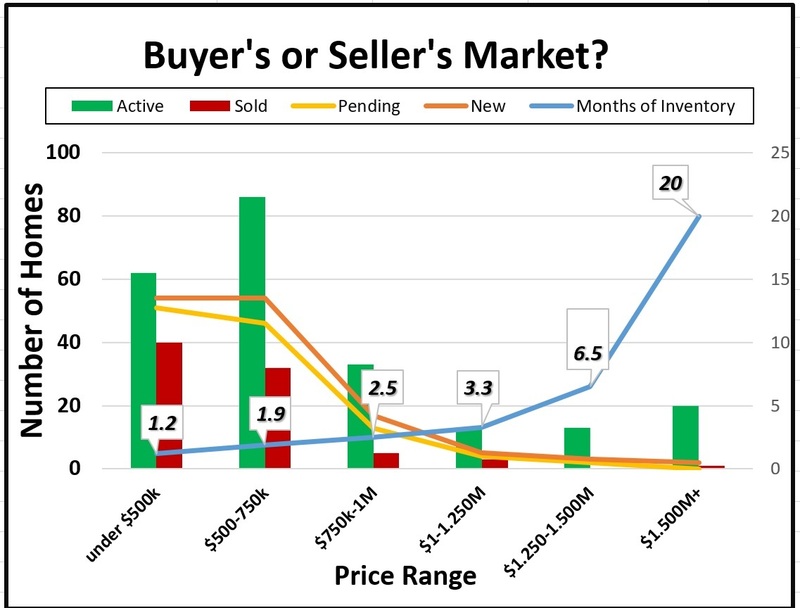 For April, it would take 1.2 months to sell everything on the market listed under $500,000. In the $500-750,000 Gig Harbor home prices the inventory is still tight at 1.9 months and is only slightly better at $750-1,000,000 category with 2.5 months. But once above $1M, buyers have a bit more breathing room and likely won’t face a bidding war for Gig Harbor home prices.. Up to $1,250,000 homes will remain on the market a bit longer, providing a 3.3-month supply and an opportunity for the move-up buyer to sell in a seller’s market and buy up in a buyer’s market. Above $1,250,000 it jumps rapidly to a buyer’s market for Gig Harbor home prices with 6.5 months of homes in the $1,250-000-1,500,000 category and 20 months at $1,500,000 plus. Multiple offers are rare in the upper reaches and sellers likely have a longer wait especially at $1,500,000. Exceptions are found for homes in high demand areas, turn-key and priced where buyers believe it to be current market value. Currently 20 homes are available with just one sold in April and none pending. So…pleased may be the seller under $750,000 and the buyer over $750,000, and trying perhaps for the buyer under and the seller over that mark. Gig Harbor waterfront high-tier sales make comeback…and other real estate news. 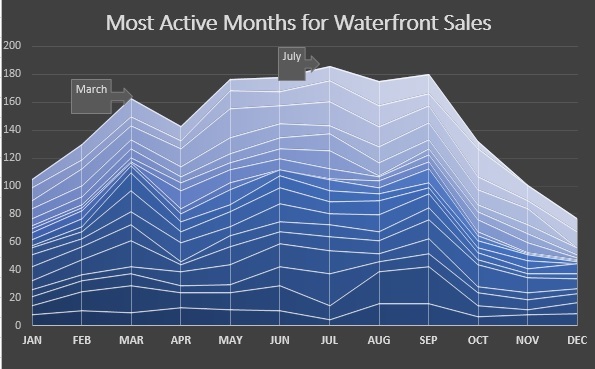 Approaching the mid-year point, when typically, one-half of Gig Harbor waterfront sales have closed, the market is on track to end the year with similar volume as last year—115-125 sales. The very high-tier–$2M plus– has already surpassed the last 2 years in numbers. With 3 closed and 2 pending, that’s a 250% increase, in just the first half of the year. It is likely we’ll see a $3M plus Gig Harbor waterfront home sell this year as well. The $1-1.25M category already has twice as many sales as the whole of 2016. The conundrum though is between $1.25-$2M. The 2 closed sales to-date compare with 13 for the 2016 year and Gig Harbor waterfront homes currently under contract support the lack of interest, at this time, for this price range. It may be that many of the sellers with pent-up desire to change homes managed to sell their homes last year. And it may be that this season’s inventory is too aggressively priced. For the first time I can remember, 40% of the homes on the market over $2M are in Gig Harbor Bay, with docks. These Gig Harbor waterfront homes were built within a five-year period a decade plus ago and likely represent the desire for a lifestyle change. Gig Harbor/Fox Is overall real estate market…. Gig Harbor waterfront best sales months are here—sellers should be on the market now! My graph is a big part of this week’s blog. By choice, buyers of low and medium-low bank Gig Harbor waterfront buy in early spring for the ability to enjoy it starting in May or June. We are approaching March—traditionally one of the most active months for sales. Relocation, purchases of “tear-down homes” for rebuilding, and purchases where the primary interest is view, rather than accessibility, provide additional sales throughout the year. Sales made in March for Gig Harbor waterfront will likely close in April or May—45-60 days out. BEST SALES MONTHS: March has been the #1 selling month in 4 of the last 18 years for Gig Harbor waterfront . March has actually ranked either #1, #2, or #3 40% of that period. Last year March was #2 in new sales. Aggregated over the years, the best months are July, September, May, June and August in that order. Those sales typically close 45 days later. But those months’ sales include more second home usage, Key Peninsula and generally under $1m price tag. MEDIAN SALES PRICE: 2006-08 were boom years for Gig Harbor waterfront prices—$800-900,000 was the median. But the year just prior to the boom—2005—the median price was where it has been the past 2 years–$600,000. TOP TIER: The over $1M category produced 1 of every 4 sales in 2015. At the market height 35% of sales were over $1M. That plummeted to 10%—then jumped to 24% last year. 2 of every 3 sales in the top tier were initiated before June, with half by March. Gig Harbor waterfront buyers want to be using the waterfront—either on land or by boat–in the summertime. INVENTORY: With Gig Harbor waterfront inventory even tighter this year, new listings, if priced right, disappear as fast as they are listed. That should keep prices rising in 2016. The median price of the 37 homes listed in Gig Harbor/Fox Island is $1,100,000 & in Key Peninsula $745,000 for 8 homes. That 45-house total is down from the past couple years. If, on the other hand, many of the 175 waterfront “pent-up sellers” enter the market, it could hold down prices. 175 is my take of the number of Gig Harbor waterfront sellers who would sell and move—if market conditions & prices permit. I believe the earliest sellers of Gig Harbor waterfront to the marketplace this year will get the benefit of low inventory, coupled with historic low interest. Gig Harbor home prices catch up to “boom” years. Gig Harbor resale home prices have climbed back to 2006’s boom year $420,000…and just 6.6% off that year’s summer bubble. 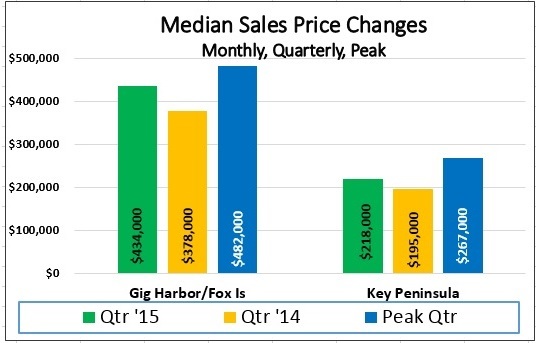 So that is the resale market for Gig Harbor home prices. New construction is another matter. Off 35% from its 2007 high, the forces at work may not allow local prices to catch up for several reasons. National and regional builders, rather than local small builders of 10 years ago, are building smaller on smaller lots (thank you Growth Management), with less detailing for the main part. Many of current lots, other than Harbor Hill, were picked up at rock bottom prices from banks who acquired them in the recession. Lot prices will increase as new inventory comes online…but the pipeline is slim and then in-fill lots will be the future. I believe Gig Harbor North will be built-out by 2017, considerably ahead of original plans. Interest rates finally started their climb which will bring buyers to the buying table sooner than later, even though these are historically some of the lowest. I expect rates to remain under 5% for the year. Lending requirements are beginning to loosen a bit which will particularly help first-time buyers. Wages are still a drag on the economy. That will either slow the creep for Gig Harbor home prices or continue to magnify the difference of who can buy and who can’t. Inventory will remain low for two reasons. Sellers are waiting to cash in more of their equity with higher Gig Harbor home prices. But more likely those same sellers can’t find a home to move into. There is a very large “supply” of sellers with “pent-up” selling desires. Waterfront home sales are “behind” 150 or more that should have sold historically during the period of the recession. The 120+ sales in each of the last three years hasn’t caught up to the recession years with only 4-5 dozen home sales. Year of the new house, with most buyers settling for less privacy, yard and trees. But new. A 6.2% increase in Gig Harbor home sales brings the median sales price (the mid-way point in sales prices) to $378,000 for the quarter. The single month of November was $432,000 — 31% over October and 44% from last November. Prices for Gig Harbor home sales have been gradually strengthening all year after a low of $303,000 in January. This increase should allow more sellers to list – gaining some of the equity lost during the housing bust – and adding to the inventory the market badly needs. Prices are down 20% from the 2006 third-quarter peak — at summer 2005 prices. Important to note, at the peak, new homes made up a substantial number of sales at $600-750,000, elevating over-all prices. The 6.2% uptick is realistic appreciation I believe, after a stagnant 3 ½ years, ending with second quarter 2014. These are sales of existing homes – not short sales or bank-owned. Sales prices have steadily been gaining since March, except for October – at $384,000 — down 14% from the 2006 third-quarter peak. The single month of November was $448,000 –the highest single month’s sales price since August 2006 ($475,000) when prices for Gig Harbor home sales turned the corner. However, too much cannot be read into this single month. 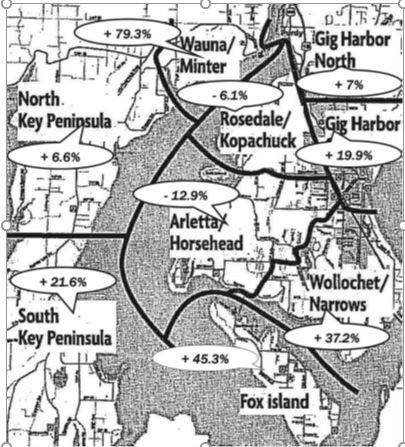 22% –11 of the sales were waterfront homes over the median sales price – never before seen in November. Contracts written but not yet closed are up with renewed consumer confidence, threat of future higher interest rates and easing of loan requirements. Inventory is still low, which can lead to multiple offers and homes selling above their list prices. Routine in the Seattle area but it happens here too. Local brokers point to the quality of some homes plus unrealistic pricing in Gig Harbor. They say buyers often will not even look at a house they perceive to be over-market but wait for a price reduction before even viewing it. With a quarter of all inventory new homes the market is decidedly different for buyers than a year ago when it made up only 16%. With fewer resale homes – and more new homes –some buyers are having to change search parameters – especially when it comes to lot size. The Growth Management Act regulates density where utilities can service it, forcing smaller lots. Half of new homes currently are on smaller square footage than the traditional 12,500 – 35% are on 5000 or less –and half of those on less than 2300. This can provide more buyer interest for resale homes on larger sites. The distressed market continues to retreat — just 10% of Gig Harbor home sales. It was 13% last year. The volume of pending sales throughout the Puget Sound—including Gig Harbor & Key Peninsula– is at a 9-year high. That is a turn-around from the slow earlier 4th quarter and 1st quarter. Interest rates are going to bump up, as much as 1% next year, according to Freddie Mac, encouraging buyers to make decisions sooner. A one point rate increase relates to 10% less purchasing power for the same payment. Credit is getting easier, with lower FICO scores being accepted and Fannie Mae and Freddie Mac are planning to offer 3% down loans. Owners are regaining some equity lost over the past 8 years and many have been waiting to market their home until prices improved. Many of those are looking for a lifestyle change. I estimate there is a “pent-up demand” by more than 200 waterfront owners alone who would like to make a move. I believe more of those owners will put their homes on the market next year, based on recent figures showing a volume increase of 25% between $750-1M and 50% over $1M in the past 3 months. Houses are sitting an average of only 75 days on the market, down from 108. Gig Harbor has just a 4.4 month supply of homes on the market, Pierce & Kitsap counties 3.3 months & King County less than 2 months. This puts pressure on Gig Harbor home sales. The median sales price for Gig Harbor home sales increased around 4% for the past 3 months — for Gig Harbor at $379,000 but is still swinging widely in Key Peninsula from $165,000 to $245,000. The higher tier has shown more improvement—$750,000-1M is up 5.8% and even $1M+ is up .2%. Here’s my advice for today’s sellers. Technology has put the buyer in the driver’s seat, in determining what a house should sell for—so sellers cannot add “fluff” to the listing price, hoping to find a buyer who isn’t knowledgeable about the market. Buyers are knowledgeable. And for buyers—keep in mind that one point in interest rate increase will buy you 10% less house, at the same time that prices are going up. July itself is not usually a high sale volume month for Gig Harbor home sales (or any other area) with vacations. Only 2004 and 2013 were better in last 12 years, so in perspective, this is not bad. The middle one-third of Gig Harbor home sales ($325-500,000) has predictably shown the least downturn in sales volume and the top one-third ($500,000 plus) has shown the least downgrade on number of contracts written (pending). Contracts written but not closed indicate current activity, thereby important because they show “move-up” activity as well as increased market strength and pricing for the higher tier. Pending sales for the quarter are down but shot up 14% from June, which is the experience local brokers have seen. Most central Puget Sound counties had the same experience. The median price is appreciating–$387,000 for the quarter and $410,000 for July. July is also up 3.8% over June and up 25% year-over-year for the month. It has been gradually strength this year, after starting very low at $303,000 in January. This increase in prices for Gig Harbor home sales will encourage more sellers to list, adding the inventory the area badly needs. We are down 18% from our 2006 third-quarter peak–or at summer 2005 prices. But at that time new homes made up as much as 40% of the sales, priced at $600,000 plus. The King/Pierce/Snohomish market as a whole is down 12.6% from the peak—the lower figure representing ever-strong metro King County. Price increases are not exorbitant–just realistic appreciation. Brokers area-wide are saying sellers who overprice their homes face disappointing consequences. Sales prices have steadily been gaining since the first of the year–now at first-quarter 2006 prices $395,000. August 2006 the peak–we are down 18% from the peak. Inventory is still low, which leads to multiple offers and homes selling above their list prices. Brokers throughout the Puget Sound point to the quality of some homes plus unrealistic pricing hindering sales. They say buyers often will not even look at a house they perceive to be over-market but just wait for a price reduction before viewing it. This distressed market represents just 12% of Gig Harbor home sales—slightly less than the 14% in 2013. The single month of July was even better at just 6.5%. Sales volume is down significantly following the last 2 “makeup years”. Sales over $1m are running at just half-speed from those 2 years.